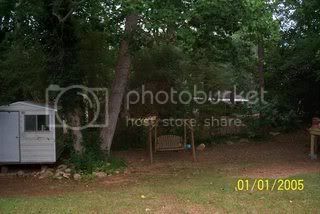 ok so here are some pictures of my yard. 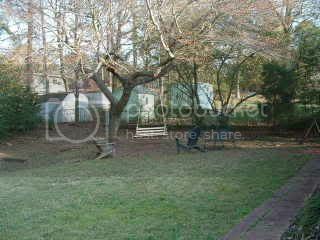 In these pictures you can see the yard pre-deck. The shed is on the wall you are looking at in the first picture. I planted 3 hydrangeas down the front side of the deck. I'm trying to accommodate my husbands wishes to not use lattice under the deck. So I figure I will cover it up with pretty bushes. This is the shed that is next to the deck. The thin bed between the walk way and the wall is all cleaned out now as well. I want to plant a climbing something, so any ideas on that are welcome. It gets full sun. 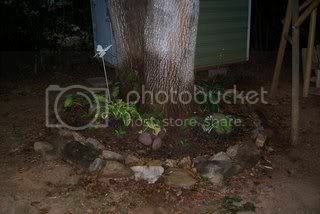 The little tree was a pecan but i had my hubby rip it out, because i didn't want root problems that close to the house. I just planted a "Loropetalum" but i didn't pay attention to how big it was before i planted so i have a feeling it's 15 ft size will definitely outgrow that little space. I know "DUH"
These two pictures are of the tulip poplar bed before and after. 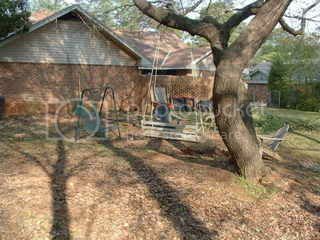 Yes thats the same tree between the small shed and the swing. I planted hostas, ferns and just recently a bunch of bulbs. I have more ferns to plant. But I am holding off to see what it looks like next spring once the hostas and ferns fill out, and the bulbs come in. We are working on the lawn to get rid of weeds and fill in all the blank spots. But i have a great vision. HOpe you all enjoy my story, and if you have any suggestions, please throw them out. My next blog will be picks of the deck now and from different angles. That's quite a large yard to work with, you are very fortunate indeed :) The established trees really embellish it also. Looking forward to your next blog entry faunsnyder. Faun that is a huge yard, oh the gardens you can create in one that size. 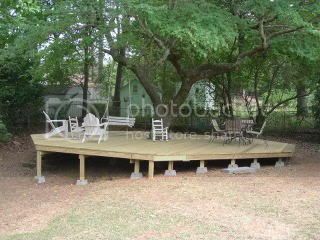 Your deck looks nice too, looking forward to the next set of pictures. Hey I love the swing bench you have Faun!! Boy how I'd love to have a garden the size of yours. I really like the poplar bed you've created underneath the tree - it's going to look even better once all the plants have matured. I have a few suggestions of climbers you might consider planting in your narrow bed. Clematis Tangutica - bell shaped yellow flowers in abundance. Clematis Armandii 'Apple Blossom' - very fragrant. Iceberg floribunda rose - Pure white. Honeysuckle - Lonicera Horwood Gem or Aureoreticulata - both have lovely variagated foliage. I look forward to seeing more piccies of your garden soon. Great sized yard Faun! Oh and I just love that swing too! Thanks guys, I love all the support. That swing has been in my husbands family for a good while, although the wood has been changed out the metal and memories are still intacted. My step-daughter is 16 now but it wasn't too long ago she would sit out there and swing for hours, if she was feeling down or just needed time to herself. P.S. Sorry about teh picture thing i hope i remedied the problem. What a nice yard with loads of possibilities. Along the shed:--you mentioned that you would like to plant some climbing somethings. Heh heh heh. Have you considered clematis plants? I would suggest the Clematis "Xerses", the Clematis Montana (one of the many white ones) and Clematis "freckels". If you have never used clematis in your garden I would recommend reading-up on them. There are techniques for getting the best out of the. Of course we can help too with specific questions. I think that everyone that has seen this blog really likes your garden and want you to succeed. That Tulip popular is a great tree to have in your garden. Not enough people have them. I wish that I could have one on my lottie, but there's no space for it. Have you ever thought od having a couple of fruit trees? 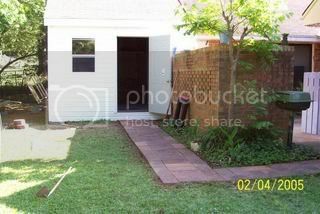 Do you have an edge to your back yard where you could make a "border"?